9 cyclists died in bicycle accidents in New York City during the first 6 months of 2017 according to recent articles by Aidan Gardiner in DNA Info. During the same period of time last year 12 bicyclists died in New York City and respectively 5, 10 and 7 in 2016, 2015, 2014 and 2013. Indeed despite the launch of Vision Zero in 2014 and after a drop in 2015, the number of bicycle accident fatalities was higher most of the time than what it was in 2013 before Vision Zero was launched. The main reason why the number of cyclists fatalities remain high is because the number of people using bikes in New York City has been exploding over the last few years. 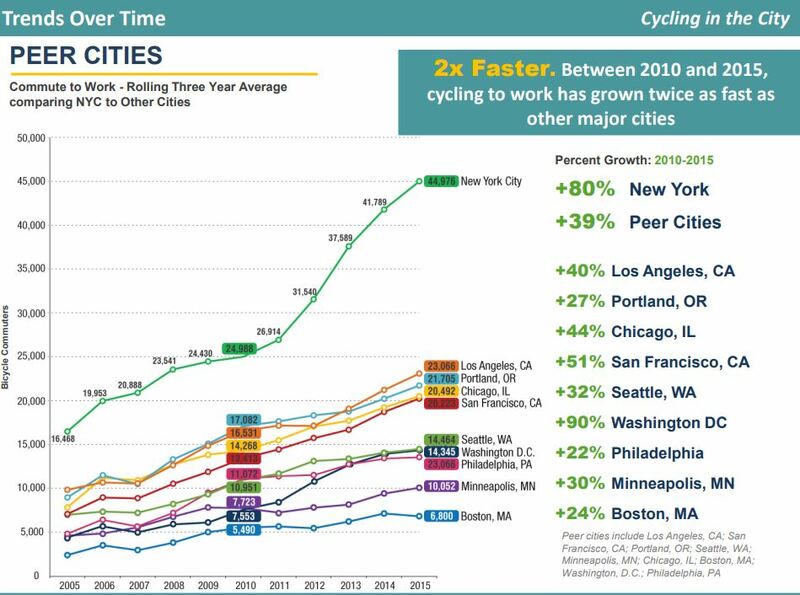 According to data from the NYC DOT (see graph below), the number of people commuting to their work by bike has grown by 80% between 2010 and 2015, faster than in any American city. A better way to find out if the streets are safer for New York City bicyclists is to compare the ratio of cyclists deaths to the number of commuters for example. In 2013 this ratio was 10/37589 = 0.026%, in 2014 it was 5/41,789=0.011% and in 2015 10/44,976=0.022%. This ratio indicates that streets were safer in 2014 and 2015 than they were in 2013. However the ratio also showed that when Vision Zero was launched in 2014 street safety for bicyclists increased significantly but then dissipated after the launch. The data shows that street safety for bicyclists must be an everyday focus at all levels of the Vision Zero program. The NYC DOT also calculates the New York City Cycling Risk. This indicator compares the Bicyclists Severe Injuries and Fatalities (KSI) to the estimated million cycling trips taken in New York City every year. 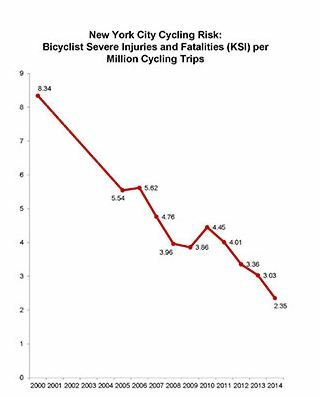 According to the most recent report of the DOT, the bicycling risk has been constantly decreasing since 2000 and was at its lowest in 2014 (see graph below).